Down Side Up Mommy: Venus Embrace Sensitive VoxBox Review! The personal opinions and reviews expressed on this blog (Down Side Up Mommy) belong solely to me. The reviews posted on this blog are my own thoughts, ideas, impressions and opinions of each product. All reviews are my honest opinion. I am not paid to write these reviews. In most instances the product provided for the review was free of charge from the company. I received these products complimentary for testing purposes from Influenster. Are you an Influenster member? I AM! and I LOVE IT! They send me these packages called a "VoxBox" which is typically a box filled with random goodies for you to try and review! "Influenster is a free-to-join community of trendsetters, social media masterminds, and educated consumers who live to give opinions of products and experiences. But that's not all. We have a lot going on including digital challenges, twitter parties, & contests!" 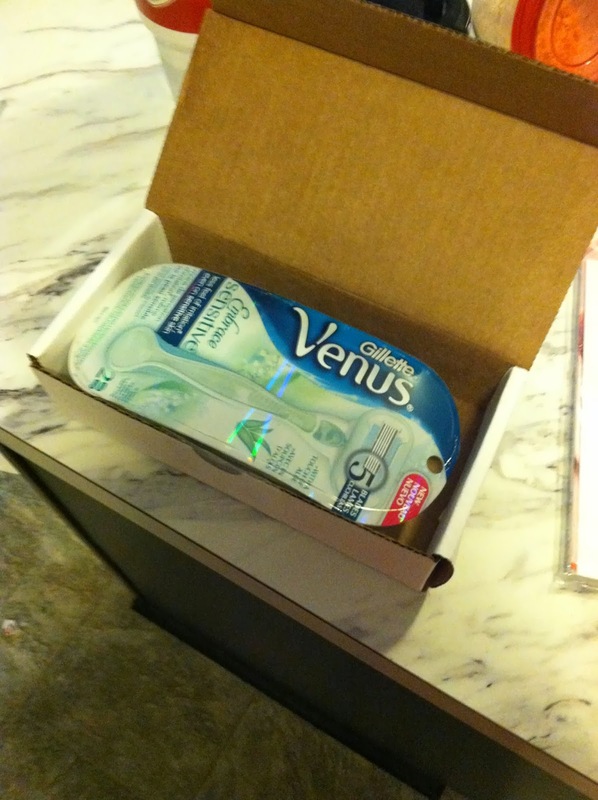 Today I received the Venus Embrace Sensitive VoxBox in the mail! So you've heard about our famous VoxBoxes, and want to know more? VoxBoxes are boxes filled with complimentary products from your favorite (or soon-to-be-favorite) brands. Not all Voxboxes are created equal: some programs feature an assortment of products while others will spotlight one awesome brand. But make no mistake: All VoxBoxes are created awesome!" I had not shaved my legs in about...i'm not sure how many weeks. After all, shaving stops in November, right? Regardless, I was looking forward to putting this bad boy to work. All jokes aside, i was VERY PLEASED with this razor. I was so pleased that I'm pretty sure I will purchase this brand once it hits shelves. This was the closest shave ever. 24 hours afer i shaved it still felt as if i just got out of the shower. 48 hours later it was barely a stubble. 3 days later and I'm feeling minimal stubble. With my old razor i would say day 4 with this razor = day 1 with that razor. I totally recommend this product to every woman out there.